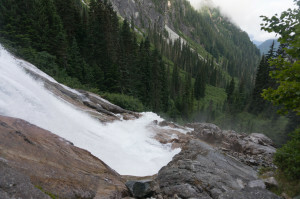 The Chilliwack Group, located at the head of Depot Creek just south of the Canadian border, contains several of Washington’s highest 100 peaks and several decent-sized glaciers. I had meant to tag most of the peaks in a long traverse last year, but ran out of energy after just Spickard, the least interesting of the four I had planned to tag. This year I returned for the unfinished business: the Mox Peaks and Redoubt. 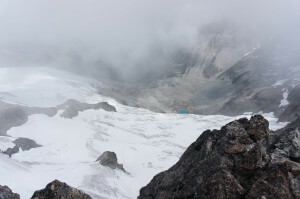 All require both glacier travel and at least fourth class climbing; “Hard Mox,” possibly the hardest, is reached by a circuitous route over rotten rock that is somewhere between 5.2 and 5.5 depending upon who you believe. I had toyed with the idea of re-climbing Spickard to establish an FKT for the whole area, but ultimately decided to just climb the new stuff. This was a good decision, as the day was long enough as-is, and would have been much less fun if rushed. 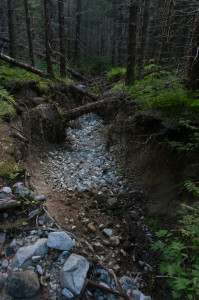 The Depot Creek road has degraded in the past year. A fallen tree at roof-height stopped one car with a roof box, and I chickened out at a nice camp spot a mile or so short of the open area where people parked last year. The road beyond the old parking area, semi-drivable last year, had turned into a six-foot-deep (er, two-meter-deep) gully, making it entirely beyond repair. Starting at 5:30, I took about an hour to reach the border swath. Based on the register, the trail sees very little traffic, and I saw my entry from last year about a page back. Once in the old growth forest south of the border, the trail is easy to follow and only mildly overgrown with blueberries; with cooler temperatures, I was comfortable bashing through with pant legs attached. The huge cascade at the head of the valley was no less impressive than last year, with the same alder crossing and hand-line through the misty, slimy part. After some steep climbing, I reached the bog at the foot of the upper valley, and turned left on the faint trail to Ouzel Lake. I’m not sure if the lake counts as “scenic” or not: it is dyed blue by glacial till, surrounded by purple flowers (and one orange tent), and ringed by glaciers, but sits on a plain of barren morainal slag that looks like mine tailings. I saw a few possible Ouzels as I crossed the various streams feeding the lake, though I didn’t notice them diving or swimming. Past the lake, I followed the obvious route up to the far left-hand side of the Redoubt Glacier. After contending with a tricky bit of gritty, freshly-exposed slabs, I put on crampons and mantled up onto the bare glacier. 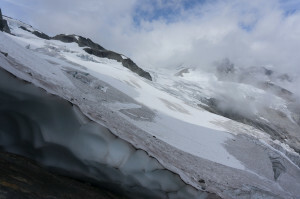 The traverse up and right was low-angle and mostly crevasse-free terrain, though the rest of the glacier around Ouzel Lake to the west presented a much trickier crevasse maze. I aimed for a logical-looking place to gain the rock and, after a bit of third class scrambling, found some slings suggesting I was on the right route to somewhere. The scramble deposited me at a saddle on Easy Mox’s broad class 2-3 north ridge. Hard Mox, across the way to the south, looked especially fearsome from this angle, with its vertical east and rotten north faces on display. After gaining most of the necessary elevation on easy terrain, I dropped 50 feet down the left of the ridge at a cairn where it narrowed, then reclimbed some low 5th class rock to a notch just east of the summit. I found the expected Washington climber garbage above, with an added twist: some particularly slovenly climbers had added a fresh sling, then cut most of the old ones and left them lying there. Ugh. I tried to examine the remainder of my route from the summit, but upper Redoubt was covered in clouds, and the west face of Easy Mox, which I had to descend, was too steep. Hard Mox just looked hard and chossy. Retracing my steps, I downclimbed the 4th class, then continued down a chossy, white-ish bowl toward Hard Mox. When this bowl looked like it might cliff out, I headed left into another, then back right where it cliffed out in turn. Things were looking steadily worse below, so I pulled out my camera and paged back to my photo of Beckey’s route description. It described a complicated series of ledges and gullies in an upward direction, passing a “prominent gendarme” that certainly did not look prominent from above. Not helpful. Peering over the edge, I saw the kind of worsening terrain that tends to result in fear, backtracking, and cliffing out, but I wasn’t stuck just yet. 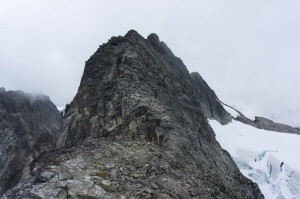 I headed down and right in a steep but safe chimney, then connected it to a ledge with a few exposed moves, heading back left toward the highpoint of the col between the two Moxes. From my perch, I could see a nice ramp trending down and left toward the ground, only a few steep moves away. I carefully chose the least-bad holds on the way, but still had something come off below one of my footholds, which somehow held. “Lucky break,” I suppose. Somewhat rattled, I made the rest of the descent to the saddle, then took off for Hard Mox along a faint but well-cairned trail. The terrain reminded me a bit of the Minarets in the Sierra, with lots of steep gullies, random cliffs, and rotten rock. 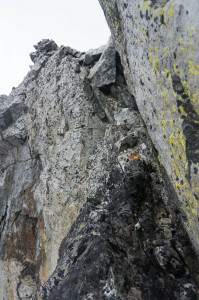 The route leading through a notch to the southwest side of the ridge, then traversing down and up to the saddle at the base of the summit tower, is mostly class 2-3. I tried to shortcut the main down-and-up, and was promptly cliffed out for my trouble. Beckey mentions a “5.5 or harder” move above the saddle, but I found nothing harder than maybe 5.2. After a traverse and a nice secure chimney, I found the crux of the route to be an ugly, cramped ledge leading left above some white rock to the final, easy summit scramble. In addition to a copy of Beckey’s original entry, the register contained more and less familiar names going back quite a few years. I added mine, admired the view for awhile, then downclimbed and hiked back to the saddle between the two Moxes. 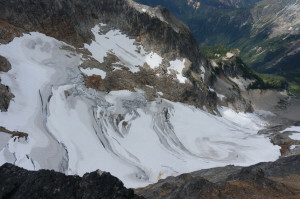 The best route to Redoubt traverses above the head of Redoubt Creek before climbing to the flat upper Redoubt Glacier. This looked like a horrid talus-slog from above, but after some loose scree descending west from the Mox Peaks, I found mostly stable and pleasant boulders. 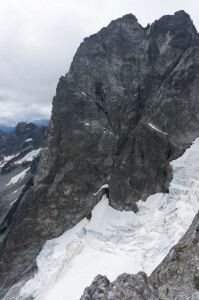 I reclimbed some slabs to reach the mercifully flat and crevasse-free upper Redoubt Glacier, then crossed below the step in Redoubt’s gnarly south ridge to reach easy but wretchedly loose talus on the south and southwest side. Above the talus fan, this whole side of Redoubt is a series of fins and gullies of varying difficulty and quality. I followed the path of least resistance up and left, aiming for roughly where I expected to find the summit. This generally worked, with a bit of extracurricular fifth class leading to the summit. A layer of clouds just above summit level cast interesting patterns of light and shadow on the crevassed Redoubt and Depot Glaciers below, and kept it cool enough on top to put on a warm hat for the first time this month. 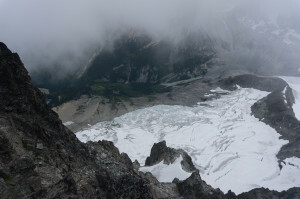 My plan was to descend around to the north and down the West Redoubt Glacier, a standard route according to Beckey. The glacier had looked crevassed and tricky as I passed by on the way up, but I figured I could deal with it. 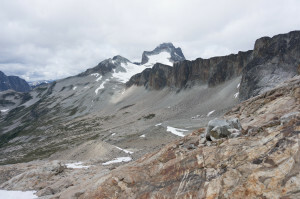 The route appears to be little-used, and after descending too far along the apparent new standard route from Ouzel Lake, I reclimbed a bit through fins and gullies to reach the west-facing talus slopes leading to the col at the head of the glacier. I found loose but not especially treacherous terrain, and no sign of human passage. Looking down, I saw some complicated terrain and a couple of cracks that might extend all the way across the glacier, and began to question my route choice. Still, I hopped over to the snow, pulled out my axe, and started down. I made it past the first crack I had seen, but was faced with a dubious snow bridge and a slightly unpleasant downward jump at the second. The jump would have worked, but things looked like they only got worse below. Changing plans, I traversed to the bare northern side, where I dismounted to the slabs the shrinking glacier has left behind. Freshly-exposed slabs are often covered in unpleasant grit and choss, but these were clean, so it was relatively straightforward to find a third class path along the glacier to its snout. Glancing behind me as I descended, I realized that crossing some of the steeper crevasse fields was somewhere between desperate and impossible. Hiking through stable debris along the stream below the glacier, I thought I was home free, but I did not anticipate the bog. 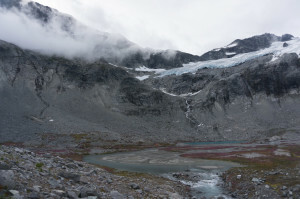 Knowing that I would eventually have to be on the right-hand side of the stream, I crossed above the valley bottom, only to be faced with a brushy swamp where several small streams from the surrounding glaciers meet and mingle. After the first foot-soaking, I squelched through the marshier patches where I could to avoid the brush, finally wading the calf-deep stream from Ouzel Lake to finally return to the trail. Done with the wet part of the day, I wrung out my socks, then motored the long but surprisingly pleasant return down Depot Creek, reaching the car well before sunset. Great stuff you’ve been doing! Thanks for sharing everything. Thanks! I hope people read about these things and get inspired to go out and do something bigger, wilder, and faster. There is so much amazing moderate alpine terrain out there, yet so few trail runners seem to know about it.